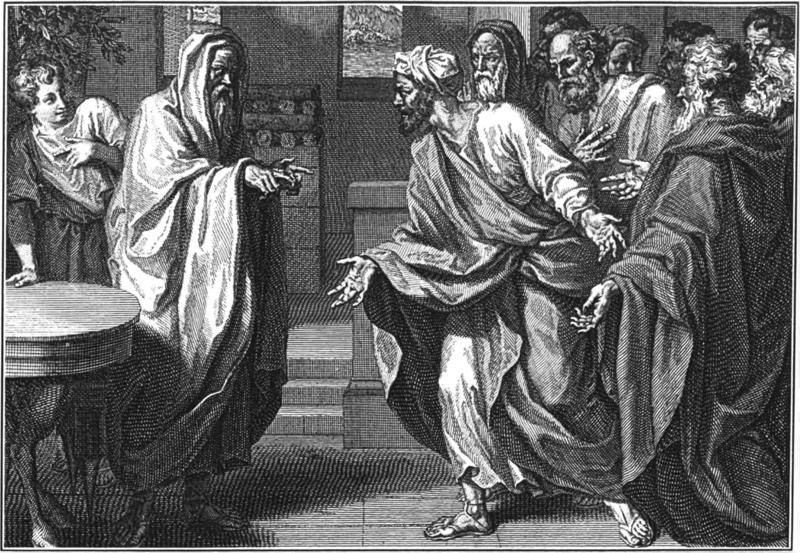 4 So all the elders of Israel gathered together and came to Samuel at Ramah. 5 They said to him, “You are old, and your sons do not follow your ways; now appoint a king to lead us, such as all the other nations have.” 6 But when they said, “Give us a king to lead us,” this displeased Samuel; so he prayed to the Lord. 7 And the Lord told him: “Listen to all that the people are saying to you; it is not you they have rejected, but they have rejected me as their king. 8 As they have done from the day I brought them up out of Egypt until this day, forsaking me and serving other gods, so they are doing to you. 9 Now listen to them; but warn them solemnly and let them know what the king who will reign over them will claim as his rights.” 10 Samuel told all the words of the Lord to the people who were asking him for a king. 11 He said, “This is what the king who will reign over you will claim as his rights: He will take your sons and make them serve with his chariots and horses, and they will run in front of his chariots. 12 Some he will assign to be commanders of thousands and commanders of fifties, and others to plow his ground and reap his harvest, and still others to make weapons of war and equipment for his chariots. 13 He will take your daughters to be perfumers and cooks and bakers. 14 He will take the best of your fields and vineyards and olive groves and give them to his attendants. 15 He will take a tenth of your grain and of your vintage and give it to his officials and attendants. The book of 1 Samuel records a major change from the time of the judges to Israel’s first king. The judges had led the Israelites for about 350 years after the death of Joshua. During this time the Israelites called their leaders ‘judges’. Samuel was the last of the judges. He was also a prophet and a priest. Samuel anointed Saul, the first king of Israel. But Saul did not obey God. So, God chose another king, David, who would obey him. 1 Samuel ends with the death of Saul. The book of 2 Samuel records the life of David as king. Verse 20 tells us the real reason why the Israelites wanted a king. They wanted a king to fight against their enemies. They wanted a king to lead them to war. But God led them when they went to war. They always won their battles when they trusted God. A human king can not promise that he will always win wars. But the Israelites often forgot God because they could not see him. Samuel warned them what a human king would do to them. He saw what the kings of other nations did. Many times Samuel said ‘he will take’ and ‘he will make’. A king would take a lot for himself and his friends and servants. He would take all the best things. He would take people and animals. He would take crops and land. The people would have pay taxes to him. This would be hard for them. Sometimes they could only grow enough food to feed themselves. The people of Israel already had to give a tenth part of their animals and crops to the priests (Deuteronomy 14:22-29). Samuel knew that the king would demand all these things and this would make them unhappy. Samuel warned them of the disadvantages. But the people could only think of the advantages. They would not change their decision even though it was not the best for them. God gave them what they asked for. However, in the future, God would not help them when they complained. They would get what they deserved. In verse 22, the Lord said to Samuel ‘You must give them a king’. This does not mean that Samuel chose the king. God chose the king. Then the people went home to wait for their king. What is the difference between a judge and a king? What did God tell Samuel? What are examples in today’s society, when we want something or someone in spite of what our God might have in mind? How important is the character of a king to a nation? In these verses we find a house divided. Jesus’s family sees His actions as abnormal and attempts to stop Him. Jesus simply asserts that he is doing God’s work, and to suggest otherwise is blasphemy against the Holy Spirit. More astonishingly, Jesus refers to this form of blasphemy as an unforgivable sin. But this raises an interesting question. As there is no apparent reference to blasphemy against the Holy Spirit in the Old Testament, what is it? A simple answer is that to blaspheme against the Spirit is to undermine the work of God in the context of the economy of salvation. Jesus insinuates that the commission He has given to the Apostles is relatively important. If we read the commissioning in the Synoptic gospels we see that the work of the apostles is to preach, to heal and to cast our demons. These are apostolic works ordained and willed by God. These actions and miracles point to the Kingdom of Heaven, and they bear testimony to the authority that Jesus has. For the scribes to insinuate that Jesus might be doing the devil’s work is a blasphemy of the highest order. It suggests that Jesus is not of God, and that these mighty works of God are fraudulent. We should take care not to interpret the blasphemy against the Holy Spirit too lightly. We should never testify against the will of God, or disparage or deny the works of God. How would you describe the unforgivable sin that Jesus talks about here in Mark? How might a family become a divided house such as Jesus had? Jesus responds to false accusations of insanity and being of satan – How did he handle His response? Jesus redefines the criteria for who constitutes His true family – To what? What are the ways people undermine the work of God?